Beneath the music of a farther room. I measure the advent of spring by natural occurrences visible outside my windows. First come a few of the 90 crocuses planted at random in the front yard, followed soon after by the delicate rusty pink blooms of my neighbor’s front yard crabapple tree. 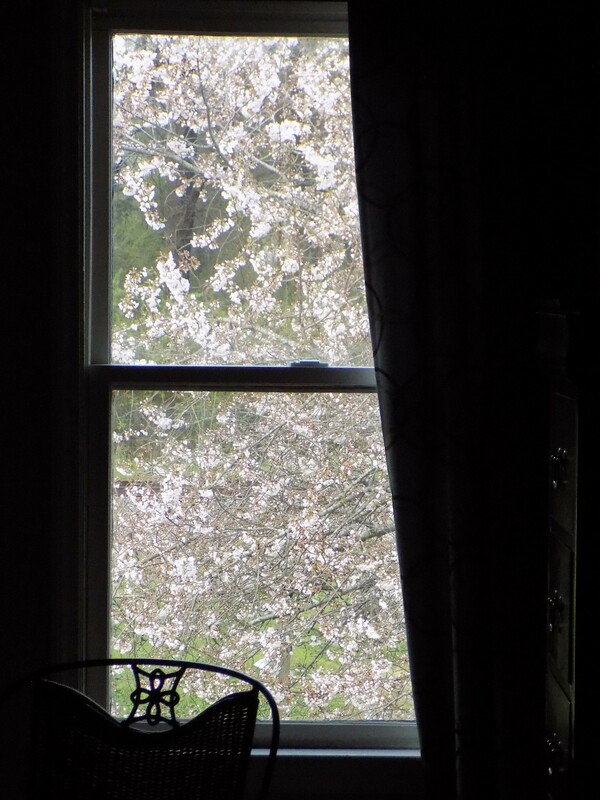 Next, that same neighbor’s large back yard cherry tree bursts into white blossoms and fills my back bedroom window. It’s filling it now. When the neighboring cherry blossoms yield to leaves, my own front yard cherry tree begins to bloom with a display of delicate pink blossoms. By the time those blossoms drop, most everything else is blooming and sprouting and leafing and the herbs that plan to return have started to do so. So far, my chives have returned with a vengeance, but my mint, surprisingly, is missing in action. The small redbud in my back yard is making me nervous again. Last year was its first year in the ground and it finally sprouted its heart-shaped leaves after a long period of acting as a dead stick. I trust it is bluffing again this year and will eventually bloom and grow as it did last summer. These small occurrences cheer me up. The longer days and the promise of summer give me hope and energy. Recently, at the end of a long conference in Knoxville, Tennessee, I was at table with four friends from various stages of my life. The conversation was lively and I must have fallen uncharacteristically quiet and pensive. “I’m just listening.” And that was true, I was listening to friends I have known for decades now and I see them annually in different places that host our convention. I was thinking carefully about their lives since we were last together … and about my own. During the time that my father was so sick, leading up to his death almost three years ago, a counselor that I was seeing said, “It sounds like now’s the time to discuss any unfinished business with your dad.” I told him that I couldn’t think of a thing that was unfinished between Dad and me. I was fibbing a little, because for several years I had been wanting to ask my father – whose health was on the decline in the years before he died – at what point he first began to contemplate his own passing. It was important to me because I had begun to think about my own mortality and was curious about when such thoughts normally set in. But I never did ask Dad the question. That was the sort of topic that was uncomfortable in our family and I did not want to ask a question that might be misconstrued as peculiar in some way. When I was a teenager, I became preoccupied with the far-fetched and unspoken notion that I would pass away at age 24, the same age as James Dean. Once I made it to age 24 and beyond, I had to assume I would most likely have a normal life span. If so, I have quite a few more years to navigate. Still, all of the aging tropes are beginning to apply to me: realization of physical limitations; thinning and greying hair; occasional soreness and aches; discussing medications and ailments with my peers and colleagues; frustration with technology; the realization that younger people may be a tad condescending (partially due to my frustration with technology). I even occasionally have to deal with the death of a friend my age or younger. I set conditions for myself when I purchased my first house a few years ago. I vowed that I would not own a house unless I was committed to keeping it up myself. I would take care of my own yard and I would clean my own house. I would take care of my own maintenance problems and, if there was anything I couldn’t take care of, I would hire a professional. Today, I hired a new guy to take care of the yard; he was finishing up just as the woman who cleans my house was wrapping up her monthly cleaning. Looking at my current life, it’s sometimes hard to find the person I used to be. As time goes on, values and needs change. Things that were routine become more like luxuries, or slip away completely. Things that used to be important slip to the back burner and things I never thought about become front and center. In the past – and for decades – I was the one who kept up with all of the current movies and theatrical events. I attended at least one and often two or more movies in an actual movie theatre each week and would often watch a rental on the nights I didn’t go out. Now I only seem to see movies in a theatre during the annual film festival that I still attend religiously. I have a hard time carving out a couple of hours to watch something at home. My viewing habits are now mostly half hour – and mostly informational – shows that I don’t have to pay much attention to as I go about my tasks. The day of the Academy Awards broadcast used to be almost like a holiday for me. I would invite people over and watch the red carpet and the interminable awards show and we would make snarky commentary. I haven’t watched an Oscar broadcast in years. I used to always have at least a couple of books I was reading at any given time. They would usually be something fictional – a novel or collection of short stories – and something non-fiction – biography or history or issue-oriented volumes. Any non-work-related reading tends to be magazines now. I’ll read an article or two if I have a spare few minutes or before I go to sleep, but it’s sometimes hard to even work that amount of reading into the schedule. I did spend the last six months of 2018 reading the first volume of Proust’s 3-volume Remembrance of Things Past. It was hard to find the time to read such a contemplative and obsessive novel but it was with a sense of accomplishment that I finished volume one a few days before Christmas. Volume two is sitting on my nightstand, but I haven’t opened it yet. I was active at a local gym for a few years, averaging a 90-minute workout five times a week. When I stopped the workout regimen, I started hiking and was dedicated to frequent moderate hikes in various locations for a while. Now, I try to figure out how I found the time to do that then. I have often said that one always seems to find the time for what one really wants to do, so maybe I don’t really want to re-launch a rigorous exercise regimen. But I know I need to. A more recent new interest is food culture and foodways. As a dues-paying member of Southern Foodways Alliance (www.southernfoodways.org), I have learned a lot from their symposia, the magazine and podcasts of Gravy, and the dinners in Florence that have served to raise awareness of the organization and of southern chefs. It has helped me to connect and understand more about where I come from and what shaped me and my people. I look forward to trips to local farmers’ markets wherever I may be. It does occur to me that my interest in food culture may not be the best response to my lack of time to exercise regularly. There was a time when I loved my transient career in professional theatre and found the idea of retirement unimaginable. Lately, the prospect of retirement is a sweet one. I love to travel, and plan to continue to travel as much as possible, but I’m equally drawn to the prospect of staying at home. I am fortunate to be a person who never really gets bored or lonely. I like to be alone with my thoughts and my stuff and I think that will continue into my eventual – and, hopefully, inevitable – retirement. For now, I try to grab as many moments of contemplation and observation as possible. Eliot’s Prufrock measured out his life by coffee spoons. I intend to measure out mine by the views outside my own window – or any window I happen to be near at the time. This entry was posted in Aging and tagged Aging, Eat the Rich, gardening, Jean Jacques Rousseau, Southern Foodways Alliance, T.S. Eliot on March 17, 2019 by gedwardjourney.